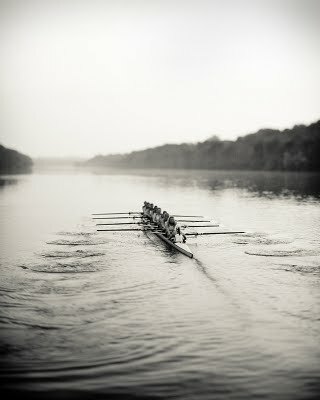 Months ago I was contacted by the US Women’s Rowing Team to photograph their 2012 Olympic calendar. I immediately called my partner, Jeremy Saladyga, whose gifts for lighting and visual concepts never cease to amaze me. 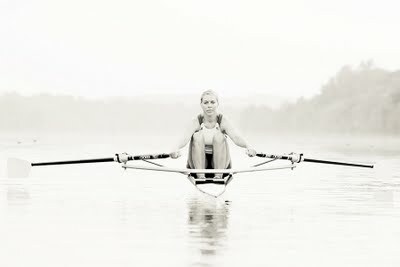 We envisioned black and white portraits highlighting the women’s strength and athleticism. 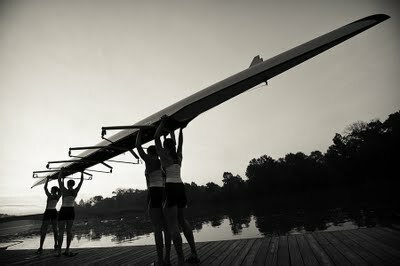 We also knew we had to take photographs of the women in action on the water, which of course had to be at sunrise. This was going to be a long day. 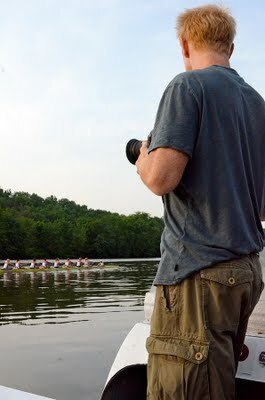 The day before the shoot we traveled to the US Rowing training facility in Princeton, NJ. I dragged Jeremy kicking and screaming to a couple of Dancers Among Us shoots, and then we were off to meet the team. They welcomed us with a lavish BBQ, which very well may have been the most intimidating meal of my life. We were surrounded by disarmingly nice and extremely athletic women over 6 feet tall. After the welcoming meal, we headed over to the team’s weight room to set up the backdrop and lights for the next day’s portraits. We requested a model to test out the lighting- they sent us Olympic gold medalist and cover girl Susan Francia. We headed back to the hotel for a few hours sleep, but instead we tossed around ideas late into the night. The schedule for the shoot was nearly impossible. We had only two hours on the water, and we had 6-8 shots we wanted to get. That meant a photo every 15 minutes, including travel time. 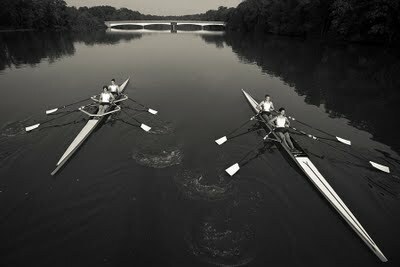 Much of the calendar will likely be these rowing shots, and we needed at least a day to get it right. Instead, we had two hours. 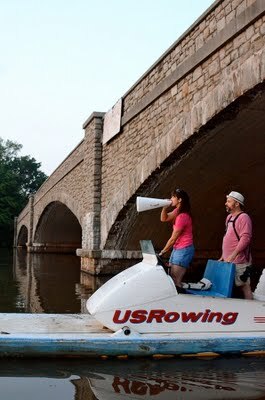 A Jeremy and I were each on a boat with a bullhorn. We were shouting directions to try and coordinate and photograph eight teams, while also making sure we didn’t get in each others way. Somehow it all came together. Before the sun rose over the bridge at 5:00am, a stunning orange hue lit up the sky. We screamed, “Someone grab a boat and get in the water. This is our light!” It was go time. The shoot was incredible! 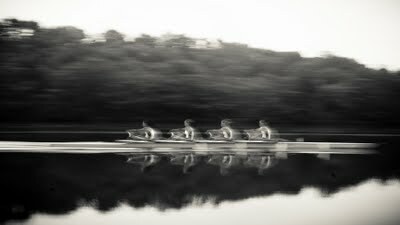 The women were extremely efficient, the water was wonderfully calm, and the light was absolutely beautiful. Our greatest success was that neither Jeremy nor I fell into the river. We were a little behind schedule, but we got all the shots we hoped for, and even some we hadn’t anticipated. We rushed off the water and headed to the studio. As we arrived, three women were in place and ready to be photographed. Several more were finishing makeup. And this was just the first group. I finally understood the expression, “out of the pot and into the fire”. They scheduled all 25 women.We rolled up our sleeves and got to work. Some photos came together organically and others had to be constructed. Many of the women have won medals in past Olympics, and we insisted on including them in the photographs. We wanted each woman’s portrait to be unique, and it became increasingly more difficult to come up with a new concept every time. Often the women would aid us with suggestions. 25 women and seven hours later, we shot our last portrait. We are proud of each one. I am thankful they scheduled everyone and forced us out of our comfort zone. After all, they know something about pushing beyond your limitations. The day was exhilarating and exhausting. We rarely stopped shooting from the moment the sun rose. We were surrounded by athletes at the very top of their profession, and we were determined to rise to their level. It was as close to the Olympics as we will ever get, and we enjoyed every minute of it. Jeremy and I will continue updates about the calendar; so keep an eye on ourFacebook and Twitter pages for regular posts and to view more photos of these stunning Olympians.